Aker Philadelphia Shipyard, Inc. (APSI), the wholly-owned U.S. subsidiary of Aker Philadelphia Shipyard ASA (AKPS) has released an update regarding an incident that occurred yesterday at its facility. According to Aker, numerous factually incorrect news reports have emerged, and this release was intended to clarify certain points. Aker reported that at approximately 6:50am, maintenance was being performed on the shipyard’s gantry crane when an electrical fault occurred. Following protocol, NAVSES and the Philadelphia Fire Department responded. 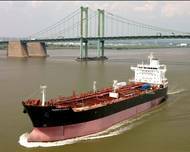 Crowley Maritime purchases two new 'Jones Act' tankers from Aker Philadelphia Shipyard. Crowley Maritime Corporation’s petroleum and chemical transportation group announce that it has purchased two new Jones Act tankers, the Pennsylvania and the Florida , from Aker Philadelphia Shipyard ASA. The tankers, scheduled for delivery in September 2012 and March 2013, mark Crowley’s re-entry into the Jones Act tanker market since its last tanker was retired in 2011. The tankers will be capable of carrying nearly 330,000 barrels of a wide variety of petroleum products and chemicals. Aker Philadelphia Shipyard ASA (Oslo: AKPS) announced that its sole operating subsidiary, Aker Philadelphia Shipyard, Inc. (APSI), has signed a Letter of Intent with SeaRiver Maritime, Inc. (SeaRiver), Exxon Mobil Corporation’s U.S. marine affiliate, for the construction of two aframax tankers. The 820 foot long, 115,000 deadweight ton tankers are intended to be used to transport Alaskan North Slope crude oil from Prince William Sound to the U.S. West Coast. Project planning work is currently underway in conjunction with APSI’s technical partner, Samsung Heavy Industries.